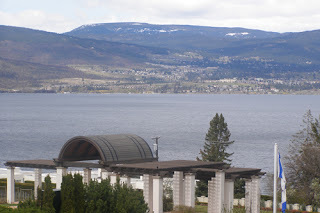 My first full day in Kelowna was jam packed with a lot more than wine. 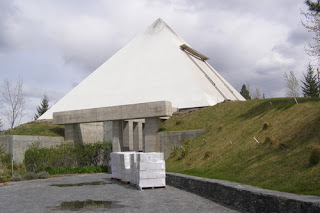 I got to spend some time with a few goats and step inside a pyramid for a piano recital among the barrels! After breakfast at the Delta Grand Okanagan, we were me t by Catherine Freschette, Media Relations Manager for Tourism Kelowna. She was our guide and chauffeur for the day. We learned quite a bit, including the fact that this area only gets about 12 inches of rain each year, making it a great vacation destination for those in the wetter areas of Victoria and Vancouver. It was easy to see how this area could attract visitors with the beautiful lake and picturesque mountains, providing skiing in the winter and watersports spring through fall. Kelowna, which means “grizzly bear” (and, yes, there are bears in this area) has five separate wine trails for a total of 25 wineries. We were spending the day on the Lake Trail, but our first stop was not about wine. 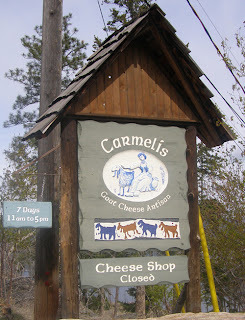 Carmelis is a dairy owned by a couple who just came to the area to check out the skiing. Ofri and Ofer Barmor ended up liking it so much that they decided to move their goat-based cheese business from Israel to British Columbia in 2003. 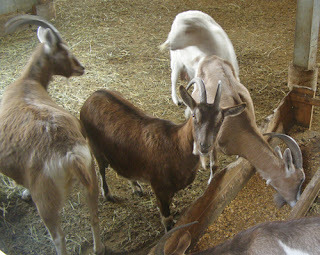 Their newly purchased 92 goats survived the area’s historic fire and by May 2004 they were selling their first cheese. There are currently 25 goats -- only one very happy male -- at Carmelis. From their milk they produce an assortment of delicious cheeses and gelatos. My favorite cheeses included Liore Special Edition, a nutty flavored cheese with basil and peppercorn, and Goatgonzola, a mild gorgonzola that’s still bursting with flavor. As for the gelato, I thought the Chocolate Hazelnut tasted like biting into a Rocher and Susan loved the Orange Chocolate Chip. We left Carmelis and headed down the road to Cedar Creek Winery, where they are putting the finishing touches on an outdoor restaurant which will take advantage of the beautiful views. 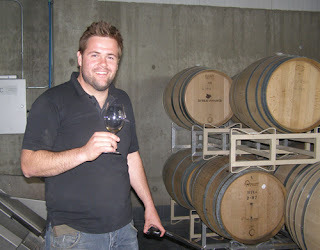 Gordon Fitzpatrick, a member of the winery’s family, took us through the newly released white aromatics. I liked most of them, but was blown away by something I’d never tasted before. The 2010 Enhrenfelser is a cross between riesling and gewurtzerminer, with tropical flavors that even give off banana. It’s light and fruity – everything a summer wine should be. Our next stop was at St. Hubertus Winery, started and continued by two brothers from Switzerland, who married two sisters, Andy and Leo Gebert. Andy took us through some of the unusual grapes they grow here, such as Chasselar and Mareschal Fouche. I really liked the 2009 Chasselar, with some mineral in the nose and lots of pineapple and apricot on the palate, almost like a sauvignon blanc. 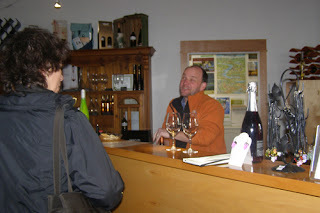 I also enjoyed both the2009 Dry and 2006 Late Harvest Riesling’s at St. Hubertus. I don’t think anything I can say in a few paragraphs on Summerhill Pyramid Winery can do the experience justice, but I will do my best. Catherine, Susan and I arrived to have lunch at the property’s Sunset Bistro, an organic restaurant led by local chef Jesse Croy. We were greeted by Ezra Cipes, son of owner Stephen Cipes, and given a glass of their award-winning Cipes Gabriel, a refreshing sparkling semi-dry wine. We ordered one of their antipasto platters, which allows you to pick your own meats, cheeses, spreads and or vegetables. We chose the Hummus, Truffled Wild Mushrooms and Caponata, which worked well with the wine. For lunch, we shared some wonderful dishes: Charred Onion Brown Rice Risotto, with garlic, merlot syrup and blue cheese; the Summerhill Reuben, a combination of corned beef, gouda, sauerkraut and ice wine mustard; and some flavorful brick oven pizzas. During the meal, Stephen Cipes himself set down with us and offered to take us to “the Pyramid.” The Pyramid – which is built exactly as you would expect one to look -- is a combination of a powerful spot and a wine cellar, all based on , according to Cipes, “the idea that sacred geometry chamber is harmonizing and clarifying.” The Pyramid is where wine is stored in oak barrels; riddling of sparkling wine takes place in the basement; and tasting and blending is conducted. This is also the same spot where former New Yorker Stephen Cipes was married and recently witnessed (along with some friends) the water birth of his daughter. I don’t know that I can give the Pyramid quite as many mystical powers as its owner, but I did find it peaceful and relaxing, especially when Cipes (and then Catherine) played the piano in perfect acoustics! It was an experience I hope to explore and write more about. In the meantime, I’d like to pass on more about another of their impressive wines, the Cipes Ice NV, a sparkling Pinot Noir Ice Wine like nothing you’ve ever tasted. Our final wine stop of the day was Tantalus Vineyards. We were just in time to watch winemaker David Patterson, who has worked in wineries in New Zealand (his original home) and Australia, doing some barrel tasting to make sure the wines were progressing as they should. 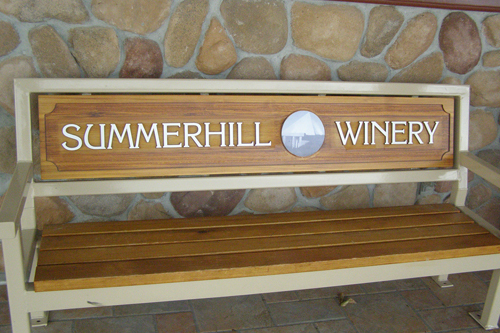 The wines are very important here, as is the environment. This winery is organic, biodynamic and Leed certified. It’s only been around since 2004 and has already developed a reputation for the handful of wines they produce on the estate, with the help of some bees in the vineyard to keep it going the natural way. They even make their own yeast. Although most of the wines at Tantalus were a bit dry for my taste, I was impressed with their just released Pinot Noir, very rich and full of good tannins and complex flavors, without a heavy smoke from oak. Susan fell for the 2010 Syrah Ice Wine, sweet with a pepper finish, something you don’t often see. I did enjoy the 2004 Sparkling Riesling, full of pineapple and banana with a nice balance of sweetness. Dinner on our second night was at RauDZ Regional Table and it was fantastic, as were the drinks. They make their own fruit purees here to go in sangrias, martinis and margaritas. 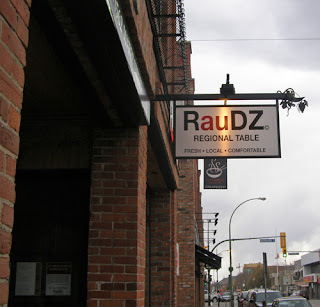 I loved the Blueberry Martini and the Apricot Peach Sangria, both fruity and without heavy alcohol. Owner Audrey Surrao took good care of us, telling us about the importance of fresh and local ingredients here in the creations of chef and co-owner Rod Butters. We had a delicious Asparagus Soup to start and I thought the Wild Boar Rigatoni in a roasted garlic cream sauce was heavenly. Susan said her Link Cod with Salmon and Shrimp was very good and we were both in heaven with the “dessert tastings,” small enough to allow us to sample the Apple Puff Pastry with Salted Caramel Ice Cream; Crème Brule with Peach Vanilla Sugar; and Mocha Cheesecake with Amaretto Chantilly Cream. The Okanagan Valley is getting more delicious each day.